Spring inches its way forward, blossom by blossom, bee by bee and leaf by leaf, but in the high country, winter still sleeps soundly at my doorstep, snow continues to fall with unyielding abandon and I crave the sun. So we pack our bags, hop in the car, and hightail it out of the valley to where the trees bloom, and I can revel in their perfume, soak in the sun. It’s odd how quickly the climate changes just ninety miles down highway fifty. And while winter won’t recede in my community for another month or so, I can experience that breath of spring, no matter how soft or brief, with a quick road trip and maybe a good soak at my favorite hot springs. Eager to sell a bit of produce before farmers market season begins, growers open up their truckbeds along the highway and sell fresh-picked asparagus and other beacons of spring from icy coolers. 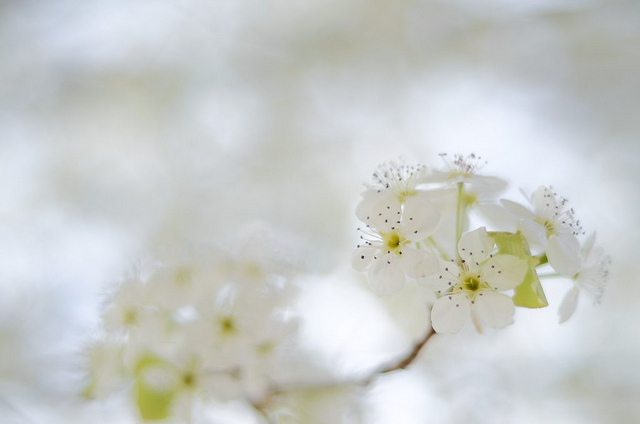 It’s refreshing – a pleasure – to rejoice in a weekend glimpse of spring before returning to an icy, icy home. Maybe it’s a toddlerhood spent eating hot tamales and sliced watermelon bought along the Texas countryside from farmers with faces as weathered and ruddy as their trucks, but I will always hold a place for highway farmstands in my heart. I can’t pass one by without pulling over and buying more than I rightly need. More than the blossomsand the bees and the newly budding trees, I take my pleasure in the foods of spring: asparagus, mint, chives, lettuces and peas; though, of course, no springtime list could exclude strawberries and rhubarb, eggs or cream. After squash and potatoes, overwintered apples and turnips, that first burst of sweet pea or strawberry as it rolls along the tongue provides a true pleasure, slaking a hunger that has grown for months under the weight of winter’s cold. So, as soon as I can, I pick up bunches of rhubarb – pints of strawberries. While other might be satisfied to sate their hunger with classic dishes of strawberry-rhubarb pie, crumbles and cobblers, after months of deadening winter, I need something more. So I work my way through pounds of strawberries, ribs and ribs of rhubarb, to make one dish of such concentrated beauty that I can’t but help to experience all of springs vibrant renewal in a single spoonful. I make strawberry and rhubarb compote, serving it alongside a stirred honey custard. A stirred custard is a lovely dish for spring, sweet enough, but foremostly it is luxurious in its smooth, velvet-like creaminess. We don’t often think of cream and eggs as seasonal foods, but they are. With factory farming of hens and dairy cows, cream and eggs are available in abundance from grocery stores whenever it suits you and with that convenience we’ve lost sight of the seasonality of animal foods. 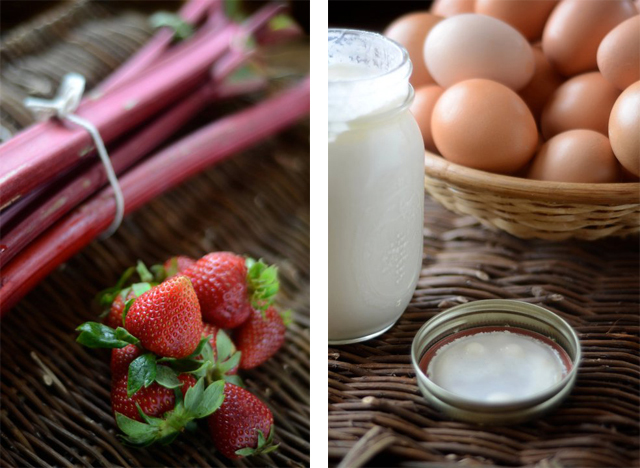 Cream and eggs are, indeed, seasonal foods: at their best in spring and early summer. You see, after a dry spell in the winter, cows calve in the springtime – right about the time of the vernal equinox, and begin to give milk and cream again. And it’s this spring milk and cream, fresh and raw and full of nutrients, that was most prized by dairying peoples prior to the industrialization of our food supply. When cows graze on the first grasses of spring, green and rapidly growing, their milk and cream is most nutrient-dense providing an exemplary array of vital nutrients essential for health: true vitamin A, beta carotene, vitamin E, vitamin C, vitamin K2 and conjugated linoleic acid. While all fresh milk and cream from grassfed cows contains these nutrients as well as food enzymes and beneficial bacteria, those nutrients are particularly concentrated during spring which is why traditional peoples from Europe, Africa and south Asia prized spring cream and butter over other foods – holding them sacred – and reserving them for those who need nutrition the most: young couples trying for their first babies, pregnant and breastfeeding women. Sadly, with the introduction of factory farming and the push toward concentrated year-round production, we’ve lost the pleasure and celebration of one of the earth’s most sacred foods: truly fresh spring cream. So, when I can, I celebrate the loveliness of spring with creamy custards and vibrant compotes of stewed berries and rhubarb. Now go fix a bowl, just a single bite makes the effort worth your time. Strawberry and rhubarb compote stewed with honey and orange and served with a simple stirred custard. A simple, seasonal recipe for spring. Bring water to a simmer in a double boiler or in a saucepan fitted with a bowl. Scrape the contents of a vanilla bean into cream and pour into the top of the double boiler, cook until hot. Whisk in honey to taste, then transfer a tablespoon or two of the hot cream to your beaten eggs, whisking vigorously to temper them. Transfer the tempered egg yolks into the cream and continue stirring slowly until the custard is thick enough to coat the back of a spoon. Transfer to a dish and allow it to rest while you prepare the compote. To make the compote, melt butter in a saucepan over a moderate flame, then toss in rhubarb and sautee in butter until softened, about five to six minutes. Stir in strawberries, honey (as needed), and the juice and zest of one orange; reduce the heat to medium-low and continue to cook another three to four minutes until the berries are softened, but not mushy. Transfer to a serving dish and serve topped with honey custard. The honey custard sounds amazing! This reminded me that I have a question I have had trouble finding answers to. I have recently made the switch to raw milk, but I am unsure if I ought to bother cooking with it; if I heat it to the temperature of pasteurization, it defeats the point, right? And I see in this recipe you do not bother to specify raw. So to be sure I am thinking about this correctly, if I can find pasteurized grass-fed milk for cheaper than raw grass-fed milk, then I ought to use the pasteurized for cooking and the raw for everything that is not cooked to the heat of pasteurization? And I am assuming if I cannot find pasteurized milk that is grass-fed, it’s probably best for me to just use the raw grass-fed for cooking anyway? I know this post is quite a few years old now, but I would also love to know the answer to the cooking with raw vs. not ultra-pasteurized dairy question. Thanks! Can this be made with say a thick coconut milk to make it non-dairy? needed for householders if they’re thinking about selling their apartment in future. improvement project that you want to start.